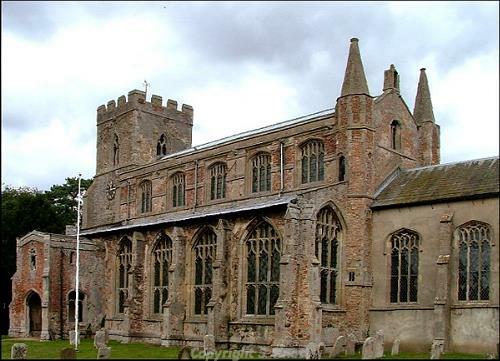 Wiggenhall St Mary Magdalen is a large parish in the west of Norfolk, situated just 10 km from Kings Lynn. It has an area of some 1769 hectares and is part of the West Norfolk Local Government District. The name ‘Wiggenhall’ is believed to derive from the Old English for Wicga’s nook, and the reference to St Mary Magdalen related to the dedication of the parish church. During the majority of the prehistoric period it is suggested that the parish was largely marshlands, and is likely to have been prone to severe flooding. In the Iron Age it is thought that this flooding may have been restricted to the eastern part of the parish, immediately adjacent to a watercourse. It is therefore unlikely that the parish was occupied during the prehistoric period, and any dry landscape available during that period has now been submerged by later marine deposits. However, a small number of objects have been recovered. These comprise a Neolithic or Early Bronze age axehammer (NHER 2395), prehistoric flint flakes (NHER 17578), a Middle Bronze age flanged axehead hoard (NHER 2243) and an Iron Age gold stater coin (NHER 21706). The presence of these, and a possible pre-Roman wooden boat (NHER 2394), indicate that the region may have been intermittently or seasonally exploited during the prehistoric period. The absence of any Roman and Saxon activity is thought to indicate the continuing influence of the nearby river, and it is possible that the land here remained as marshland for much of this period, only gradually becoming fen. However the discovery of a 3rd century Roman coin hoard (NHER 2245) in the 1860s, said to have been recovered from this parish, indicates that some Roman activity may have been taking place in or near the parish. Investigation of the early settlement is hampered by the habit of literary authors of referring to all the Wiggenhall settlements under one name. Thus the Domesday Book of 1086 lists only one ‘Wiggenhall’, and although the settlement does not appear to have been particularly populous, it was highly valued. The earliest evidence of settlement is therefore the parish church of St Mary Magdalen (NHER 2254), which is situated in the very northeastern corner of the parish. Most of the early settlement appears to have occurred here, probably due to the presence of a levee along the western side of the River Great Ouse, made of silts deposits by a former watercourse. The church itself is largely Perpendicular in style, but the tower may date from as early as the 13th century. In addition, some possible reused Norman carved stone was recorded in 1987. Today the church is almost entirely red brick, with a complex and interesting façade that is the result of a thoroughly 15th century rebuilding. Settlement therefore seems to focus on the western bank of the river, either around the church or much futher to the south, near Crabbs Abbey (NHER 2396). The more northerly sites are limited scatters of medieval pottery sherds (NHER 19076), though a concentration has been noted just to the north of the church, along with a possible medieval ditch or ditched enclosure (NHER 20654), or perhaps fishponds relating to the nearby ‘Priory’ (NHER 12123), which is the only secular medieval building in the parish. The building itself was built around 1500 as an open hall house. The hall has a crownpost roof with a parlour and chamber with ornate beams to the south. The parlour block has since been extended and clad in brick, and the whole was Georgianised around 1810 and repaired in the late 19th century. Other settlement activity has been noted some 3km further south along the river. These comprise concentrations of medieval pottery sherds (NHER 18564) a number noted in conjunction with brick, tile and bone fragments (NHER 18542, 18543 and 18544). Small numbers of medieval pottery sherds (NHER 18624) have also been noted. These indications of settlement are likely to be related to the proximity of Crabb’s Abbey (NHER 2396). The remains of this nunnery, dedicated to St John, are thought to remain on this site. Although nothing is now visible above ground, as late as the 18th century the remains of the gatehouse, steeple and south wall were thought to survive. The nunnery was occupied between 1181 and 1536, and medieval pottery sherds, roofing tile, metal work, carved stone and human remains have all been recovered from the site. This site is some 4km from the village centre, and as even this was small it seems likely that the major advantage of its positioning was this separation. Apart from these two centres, little settlement occurred across the rest of the parish. This is likely related to the fact that during the medieval period up to half of the parish, from the western border to beyond the modern day New Drain, was covered by fen. Although the parish was drained during the later centuries of the post medieval period, the settlement pattern has continued to the modern day. As a result of this drainage, the sites of five drainage mills have been recorded (NHER 14982, 15045 and 15048), but only one mill is thought to survive (NHER 19165). It should also be noted that this parish was the first in Norfolk Fens to have a steam engine (NHER 2392). This Butterley Engine was installed in 1834, replaced by a Gwynnes engine in 1914 and replaced in 1948 by a diesel engine. Unfortunately nothing remains today. Few post medieval buildings of architectural interest survive, however a Toll House (NHER 17878) survives near the junction of the Fitton and Magdalen High Roads. It has a central half-hexagonal bay with a hipped roof that protrudes onto the roof, and features two-light Y-tracery Gothick casements. Also of interest is Arch Farm Cottages (NHER 46847), which form a farmhouse which was originally constructed in the early and mid 18th century with mid 19th century additions. The parish was also the site of several small-scale industries. The sites of a post medieval brickyard is recorded (NHER 15047), and although nothing of this survives a possible post medieval kiln (NHER 14179) has been recovered.